U.S. Defense Secretary Jim Mattis warned Friday that any North Korean use of nuclear weapons on the United States or its allies would be met with an “effective and overwhelming” response. Mattis issued the statement during an appearance with his South Korean counterpart, Defense Minister Han Min Koo. “North Korea continues to launch missiles, develop its nuclear weapons program, and engage in threatening rhetoric and behaviour,” Mattis said. “We stand with our peace-loving Republic of Korea ally to maintain stability on the peninsula and in the region,” he added. The selection by Mattis of South Korea for his first visit official overseas since taking office on Jan. 20 has been noted by international security officials. He sought to reassure South Koreans who had been concerned by campaign statements of Donald Trump that many U.S. alliance commitments were a bad deal for America. 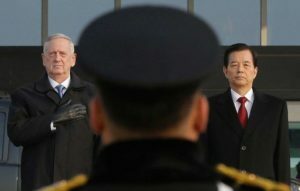 Mattis also conducted talks with South Koreans on a timetable for deploying an advanced U.S. missile defense system, the Theater High-Altitude Area Defense, or THAAAD, that is meant to improve protection of South Korea and Japan — as well as U.S. troops stationed in both countries — against a North Korean missile attack. The deployment is vehemently opposed by the regime in China which has already imposed economic sanctions on South Korea in retaliation. The current caretaker South Korean government has said it supports THAAAD deployment, but the decision is in doubt because of approaching national elections following a leftist opposition campaign to impeach President Park Geun-Hye over allegations she was responsible for misconduct in an influence scandal. Mattis was scheduled to fly to Tokyo on Friday for similar consultations with Japanese security officials. The U.S. has 28,500 troops permanently based in South Korea and about 50,000 in Japan. “Were it not for the provocative behavior of North Korea, we would have no need for Thaad out here,” Mattis told reporters during his trip to Korea.